Gold Will Not Be Eclipsed! Does gold ownership amount to “Russian collusion”? So far today, the advent of the “black moon” appears to be no more consequential than the much-feared “blood moon” around this time two years ago. If the end times are nigh thanks to the solar eclipse, it’s not showing up in the major U.S. stock indexes. The Dow is up a bit, the S&P 500 down a bit. On the other hand, the United States and South Korea are starting 10 days of military exercises today — much to the consternation of North Korea’s Kim Jong Un. So there’s potential for trouble there. And we’ve also noticed the eclipse’s path of “totality” passes over the Grand Tetons in Wyoming — which will be darkened again later this week by the presence of Janet Yellen and other global central bankers as they gather for their annual conclave at Jackson Hole. The Russian Central Bank keeps accumulating “sanctions insurance” in the form of gold. Each month, the central bank discloses the size of its gold stash. As of the latest disclosure Friday, the total is 1,729 metric tons. That’s 12.4 metric tons more than a month earlier. Americans have long forgotten how the U.S. government seized Iran’s foreign exchange reserves — held in U.S. Treasuries — after the revolution in 1979. Russians have not. Russia holds $103 billion in U.S. Treasuries even today. 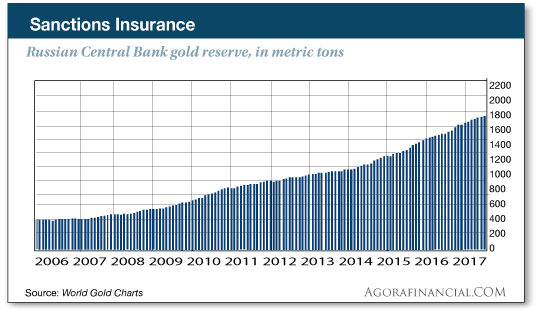 Gold really is sanctions insurance, and Russia has a lot; Jim Rickards is fond of reminding his readers that Russia’s gold stash is the biggest in the world, when measured as a percentage of its economy. We recall three years ago when ISIS was on the march — evolving from a terrorist group into a functioning, albeit brutal, nation-state in eastern Syria and western Iraq. Its leaders were making noises about establishing a gold-backed currency. We mused about whether that would make gold owners “terrorist sympathizers” in the eyes of the powers that be. For whatever it’s worth, you can even buy gold bullion on Amazon now. Wow, the markup is obscene. This morning the price is up to $1,485.95. You don’t have to try hard to find the same coin elsewhere online for barely $1,400 — even less if you don’t mind paying by check or wire and waiting for the payment to clear before your coin is shipped. What’s good for gold is good for gold stocks: “I expect these stocks to trade higher for the next several years as gold prices advance and profits grow,” Zach tells us. “When precious metal prices are high, miners can make huge profits. “With plenty of profits (and plenty of opportunity to grow those profits), miners use extra cash to invest in new mines. Often these miners take on debt to drill more holes and produce more gold and silver. Debt makes sense, management tells us, because profit margins are so big. “Increasing production eventually floods the market with more ounces of gold and silver. And Economics 101 tells us that when supply is high, prices will naturally drop. “As gold prices drop, miner profits decline. Eventually, some of the less profitable miners go out of business. Those who remain cut back on production. After all, it doesn’t make sense to invest in new mining operations when profits are falling. “With global production levels low, the supply of gold and silver ounces in the market dries up. “Once again, Economics 101 tells us that prices should rise. And as prices rise, the potential for profits in the industry is once again promising. Which is where we are now with gold about $150 higher than it was eight months ago; at last check the bid is making another run toward $1,300. But as you probably know, gold doesn’t have a yield. And most of the gold miners pay a paltry dividend at best. And it’s income Zach is after for his readers. That’s what makes his “cash from gold” technique so attractive. On the first of this month, he showed his premium subscribers how to collect an instant $300 payout off of gold. And, a few days earlier, another $300 payout off of silver. Zach’s next cash from gold recommendation is due tomorrow. Check out how it works right here. Please note: For reasons that will become obvious when you click on the link, this offer comes off the table at midnight tonight. The price of copper is knocking on the door of $3.00 a pound for the first time in nearly three years. Then came a huge rally after the election last November. 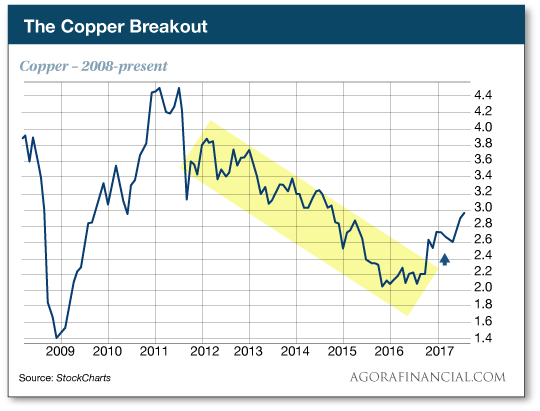 “After seven months of choppy consolidation,” Greg tells us, “copper jumped back near its March highs late last month and signaled to us that it was ready to make a play at a huge breakout. “Corrections are a good thing,” says Ray Blanco of the “penny pot stock” sector. Earlier this year, Ray and our team developed a proprietary Penny Pot Index — a composite of nearly 30 companies. It offers an instant snapshot of the sector as a whole. 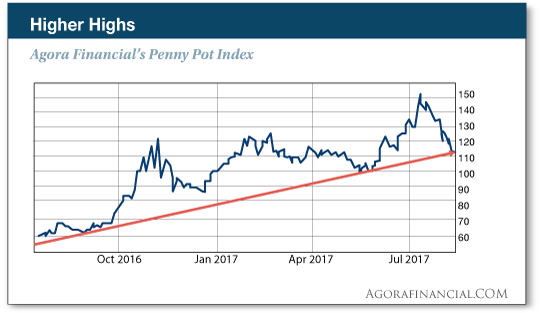 Ray’s conclusion: “If history is any indication, as our marijuana market barometer dips down to its long-term trend line, now looks like a pretty good time to be a buyer.” For access to his favorite names to trade — the average open position in Penny Pot Profits is up 20% and none of them has been open for more than three months — look here. “Even if I could scrape together the subscription price, why would I as a U.S. citizen spring for a trading service dedicated to a market from which I am legally barred?” begins today’s mailbag. We should back up a bit. A few of our readers enjoy the parlor game of picking apart our sales messages to figure out, on their own, what the actual investment recommendations are without ponying up for the subscription. Which is their prerogative of course. Some people are more successful than others. And so one of our readers seeks to weigh in on ICOs — initial coin offerings — in the cryptocurrency market. “I have read the white papers of at least eight–10 promising-looking ICOs, and so far every single one of them states that citizens, residents and green card holders (taxpayers) of the United States and Singapore are ineligible to participate in the ICO. Once the ICO is over, of course, we are free to purchase the coins on the open market. “Is this one of those things that if you have enough money for the subscription, then you have enough money to risk in these investments, ergo you must be wealthy enough to hire a lawyer if some legal ‘authority’ prosecutes you for fraud? “Do Messrs. Basenese and Hutchinson have a loophole or back door for U.S. and Singapore citizens for which they provide the information as a subscription benefit? In fact, we’re hard-pressed to think of a better way to generate ill will and terrible word of mouth. Nor would we recommend any action that would put our readers in legal jeopardy. You’re getting warmer with the suggestion of a “back door.” Rest assured all the recommendations will be legal and accessible for U.S readers. I’m afraid we’re going to have to leave it at that, out of respect for paying subscribers to The Crypto Alert. Access here. “Many of the complaints made by the skeptics regarding bitcoin and other cryptocurrencies revolve around a power outage and/or an electromagnetic pulse attack,” a reader writes. “How we would be able to access our bitcoin account in the event of such mayhem? “Hopefully, these folks are aware their versions of cryptocurrency, aka debit and credit cards, and online bank accounts will also be offline with any electrical failure. P.S. Bitcoin sank below $4,000 in weekend trading — the crypto market never sleeps — but now it’s back above that level. Louis Basenese is convinced bitcoin is on its way to $10,000. But he’s urging you not to buy bitcoin until you read this — all about the daring $2.2 million bet he just made.